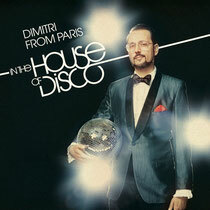 ‘Dimitri From Paris In The House Of Disco’ is the latest release from the French DJ/producer, an auditory smorgasbord of house and disco from the likes of Diana Ross, Hercules & Love Affair, Sister Sledge, Lindstrøm, Chic, Todd Terje, DJ Pierre and many more. In the late-70s and early-80s, after its bubble of underground popularity and credibility had well and truly burst, disco began it’s slow but steady mutation into house. Lindstrøm, Skream and Todd Terje are stand-out, modern-day champions of the ‘unabashed’ disco sound cited by Dimitri, and all make an appearance here, the latter’s electric ‘Delorean Dynamite’ a neon-fused, hands-in-the-air highlight at the midway point of Dimitri’s first mix. Representing true disco heritage, Tom Moulton reworks Brand New Heavies ‘Sunlight’, while Dimitri himself gets in on the action, dropping his own remixes of seminal Disco artists Sister Sledge (‘Lost In Music’), Diana Ross (‘The Boss’) and Chic (‘LeFreak’), the last two of which are exclusive to this release. CD2 celebrates all that is exemplary in ‘Neo Vintage House’, again matching House masters past and present, occasionally in the same track; the Fingers Acid Jam Vocal Edit of FCL ‘It’s You’ being a standout example. Elsewhere you’ll find a group that absolutely embodies the original spirit of House and Disco, the inimitable Hercules & Love Affair who’s ‘Do You Feel The Same?’ closes out the mix. Dimitri: “This new compilation is a testament to how disco and house are intertwined three decades after their inception,” he says. “Rather than focusing solely on classic original recordings, I wanted to show how those sounds were made contemporary without losing their spirit.